After more than 30 years in business, Europe's biggest second-hand record shop is in the throes of a huge closing-down sale. 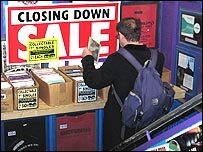 Beanos, in the south London suburb of Croydon, sent shockwaves through the world of music collecting when it announced in July that it was no longer profitable and would have to shut. Founder and proprietor David Lashmar thought he would be able to sell all his remaining stock - more than one million items - by Christmas. But with just a few shopping days left to go, eager punters are still thumbing their way through tens of thousands of singles, albums and CDs. Mr Lashmar, 62, says his decision to sell off many collectable records at knockdown prices has delighted customers, but infuriated fellow dealers. "But even though most of our singles are now at half price, we're not selling that many more, which makes me think that they were overpriced and the market was overpriced. "If I was selling too cheaply, I would have my competitors and other dealers buying from me, but they're not. "So I think what we've done is we're floating the market a bit at the moment and letting these records come down to their true level, which is a lot less than they used to be." Beanos' decline comes at a time of rapid change for the music industry that has left ordinary consumers in a state of confusion. Whether you're buying downloads for your iPod, brand-new CDs from a High Street store or rare slabs of second-hand vinyl, no-one seems to know any more what is a fair price to charge for music. Traditional music chains such as HMV and Virgin have been forced to lower their prices in order to compete with supermarkets, who now account for more than a quarter of all CD sales in the UK. And now that more than 60% of all new CDs are sold for under £10, fewer people are scouring the racks at Beanos to find used versions. "It was my accountant and my bank manager who said, 'Something's wrong, you're not making any money,'" says Mr Lashmar. "So I tried a couple of tricks - we altered the way we're retailing, we changed our stock - but we continued to spiral down. "The decline, I actually think, happened about five or six years ago, when the major record shops stopped being greedy and started selling CDs much cheaper. "CDs were a novelty when they first came out, 14 or 15 years ago. They were kept artificially high in price and there was a big differential between manufacturing costs and retail costs. "Gradually a price war started and CDs became more and more affordable. Big companies like CBS started slashing prices on their major artists. "You can buy a Springsteen or Dylan CD for £4.99 now, so why come to a second-hand shop? That's really what started pulling the rug from under our feet." Before the closing-down sale began, Beanos prided itself on having the largest collection of seven-inch vinyl singles in the world - and collectors of old-fashioned records have always valued the store's range and expertise. But here, too, changes in the music industry have made life harder for Mr Lashmar. "Nowadays, so many companies have started plundering the vaults. "If you want to buy obscure Trojan reggae singles, you can get them on a very good triple CD box set for a tenner, whereas one of those Trojan singles could cost you 200 quid. So that's where the market went for those. "Whatever the genre - be it rock 'n' roll or pop, whatever you like - people have done their research and come out with excellent compilations, which makes it much more affordable. That's taken the collectability out of that vinyl." 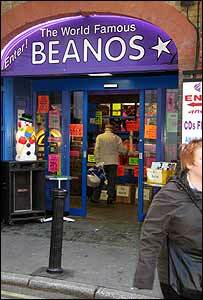 All the same, the sale is bringing in new customers who had not been to Beanos before. Kevin Tyas, 48, came to the shop on his bicycle to pick up some old albums by 1970s artists such as the Groundhogs, Genesis and the Sensational Alex Harvey Band. "I heard about the sale and I thought I'd pick up some bargains. I'm filling some gaps in my collection," he said. "I would have thought vinyl's making a big comeback - more and more people seem to be going back to vinyl. If I'd known about this place before, I would have been a regular customer, probably." But despite the huge sell-off, all is not yet lost for Mr Lashmar, who now hopes to, as he puts it, "resurrect something from the empire that was Beanos". Spurred by supportive e-mails from customers, he plans to open a much smaller store that will concentrate on the high end of the collectors' market. 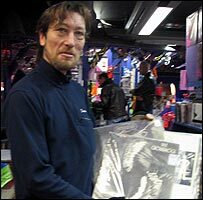 "Ten years ago, I could have a very happy business selling Eric Clapton albums for three or four quid, day in, day out. "Nowadays they're in the £1 box and they're not selling, yet a Cream original will get me £80. "That's the way the business will split. The top end will continue to go up in price and be very desirable. The average condition, average price stuff will disappear." Perhaps surprisingly, Mr Lashmar does not blame the internet for Beanos' downfall, praising the role of downloads in spreading different kinds of music to people who might otherwise never hear them. But he feels that an actual bricks-and-mortar record collectors' shop can still give virtual outlets, such as auction website eBay, a run for their money. As he points out, it is impossible to know in advance whether an eBay vendor's description of a record's condition is entirely accurate - and difficult to hold that vendor to account afterwards if the purchase fails to make the grade. "I would feel nervous, and a lot of my customers would feel nervous, spending several hundred pounds on a record without being able to pick it up and hold it. And that's why a retailer has an edge over online sales." Blood on the tracks for LP 'anoraks'?